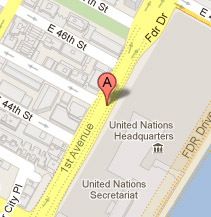 The United Nations is located on 1st Avenue, between 42nd and 48th Street on the East side of Manhattan. Using public transportation to get to the United Nations is convenient and the recommended method of getting to the UN. Take bus M15 (goes north on 1st Ave - South on 2nd Ave). There are various private parking garages available near the UN.